Medical researchers are gradually delving deeper into the area of osteoarthritis, and examining the use of near-infrared reflection (NIR) spectroscopy in order to characterize bone tissue and create advancements in standards of care for arthroscopic surgeries. There are several uses for near-infrared spectroscopy, especially in the realm of biomedical research. For instance, non-invasive monitoring, blood testing, protein identification, and many more. The near-infrared range offers top quality reflection spectra measurements, with the minimum scattering and absorption between 650 nm and 1900 nm, making it a vital tool. It has been seen as particularly attractive for the potential development of clinical applications due to the spectral measurements in the near-infrared being non-invasive and non-destructive. The Avantes family of NIR instruments have developed an ideal mix of sensitivity and resolution for medical applications with NIR spectroscopy. Their next-generation EVO electronics provide lesser noise and when working in vivo, present the most up-to-date, high-speed communications possibilities for fast data. Osteoarthritis is a common degenerative condition. It is characterized by the diminution of cartilage in and around the joints which results in pain and loss of mobility. Age is seen to be the most common cause of osteoarthritis, but, traumatic joint injury can also cause joint degeneration in people of all ages. The progression of the condition can be slowed and symptoms can certainly be managed, however the underlying causes that lead to the development of this condition cannot be reversed. 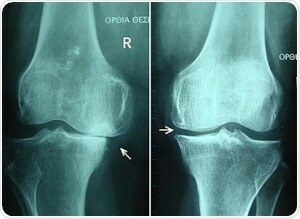 Recent studies on osteoarthritis have led to the belief that changes to the subchondral (below the cartilage) bone structures, like thickening of the subchondral plate, are apparent prior to lesions or other symptoms becoming obvious in the cartilage itself. 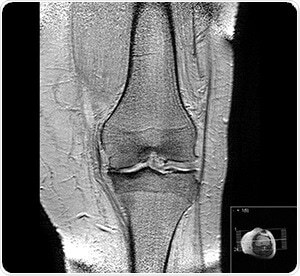 The current standards giving recommendations on the diagnosis and treatment of osteoarthritis depend on radiographic imaging to detect either of two things. First, the hardening of the subchondral layer, or second, a reduction in joint space and visual and tactile inspection during arthroscopic surgery. Recently, developments in analysis through imaging and computing power has resulted in an increased interest in the use of NIR. It is specifically thought to help quantify the progression of joint damage and assess treatment during in vivo arthroscopies. In June 2018, the University of Eastern Finland published findings in the journal of Nature. Their study investigated the possibility of near-infrared spectroscopy for characterizing human subchondral bone properties. It required a wavelength capable of estimating human bone properties in a clinical setting. 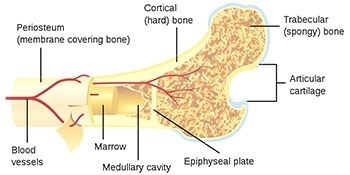 The study explored numerous significant parameters of bone integrity in bone samples collected from human cadavers. The main parameters were subchondral bone plate thickness, bone mineral density and structural model index that were measured using near-infrared spectroscopy. A dual channel Avantes system combined with the AvaSpec-ULS2048L with the high-sensitivity AvaSpec-NIR256-2.5-HSC was used to record the NIR spectral data. 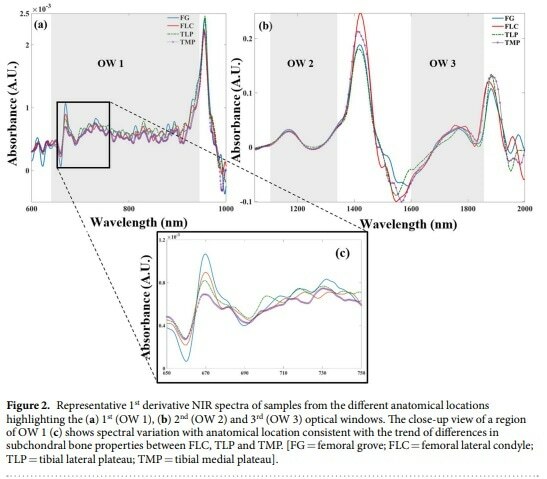 Spectra were recorded across three wavelength series already recognized for penetrative capabilities in living tissue. This is called the biologic or therapeutic optical window. Firstly, the window covered the range 650-950 nm, then, from 1100-1350 nm, and lastly, the biologic window studied was 1600-1870 nm. This data was correlated against micro-computed tomography results of the same bone samples using partial least squares regression multivariate technique. Findings showed that an important role was played in the relationship between optical response and subchondral bone properties due to the wavelength-dependent penetration of light into osteochondral samples. The strongest correlation and lowest error rate against the tomography results was identified in the first optial window; λ 650-950 nm. This presents the highest potential for adaptation into arthroscopy standards of care. Furthermore, in September 2018, additional researchers from Utrecht University, Netherlands and the University of Eastern Finland published their investigations in the journal of Nature. It sought to demonstrate the reliability of NIR spectroscopy to concurrently evaluate both articular cartilage and subchondral bone in vivo with the assistance of an artificial neural network (ANN). At present, there are no quantitative arthroscopic tools to evaluate both cartilage and subchondral bone. During arthroscopic surgeries, orthopedic surgeons use radiographic imaging, subjective scoring of injury severity trusting in visual inspection, and palpable probing with a metal hook to determine these factors. Some quantifiable tools exist for assessing cartilage, however, their use is restricted by practical problems. Currently, no clinical tool exists for the assessment of the subchondral bone morphology. The study mentioned above first collected NIR spectral data arthroscopically from ponies using the Avantes AvaSpec- ULS2048XL. This was completed 12 months after receiving investigational joint repair procedures and samples were collected from the same ponies for in vitro spectral measurements. Further control data was collected in vitro from samples gathered from unaffected ponies. These samples also underwent complete analysis of bone morphology via optical coherence tomography (OCT). This, with the support of a shallow Artificial Neural Network (ANN), serves as a reference for estimation modeling. Spectra were collected from a broad wavelength series including the visible from 450 nm through 2500 nm in the near-infrared. However, the study discounted wavelengths over 1900 nm due to water’s high NIR absorption properties. Moreover, the evident range between 450 and 750 nm showed interference from conventional arthroscopic light and thus only used for probe orientation and positioning, but was omitted from modeling. The wavelength range that nearly spans all three therapeutic optical windows is between 750 and 1900 nm. It was observed to be the ideal range for estimation of cartilage biomechanical properties, including subchondral bone plate thickness, bone volume fraction and bone mineral density. The partial least squares analysis results produced a prediction model proficient in predicting bone integrity parameters with a 95% confidence rate. Unsurprisingly, the measurements performed in vitro showed less prediction errors. This is most likely due to characteristic complications of attaining ideal probe placement while carrying out an arthroscopy. Additionally, there were less prediction errors for evaluating the biomechanical properties of cartilage in comparison to investigation of the subchondral bone due to the tissue depth. Nonetheless, the researchers determined that NIR spectroscopy was able to simultaneously characterize articular cartilage along with subchondral bone integrity in humans, with the possibility of enhancing conventional arthroscopy techniques in the clinical assessment of defective joints. Within the medical field in particular, light is used for many things; to monitor health status, to complete diagnostic testing, to support the treatment of chronic wounds, and to find and fight cancer. New discoveries are made every day that advance medical science. Researchers depend on trusted instruments to provide them with the ideal balance between high resolution and high sensitivity which is what Avantes can provide. Instruments from Avantes also feature a modular design perfect for configuring multi-channel systems. The company has twenty-five years of knowledge and experience which comes hand in hand with researchers and manufacturers of medical and pharmaceutical solutions designing systems. This, in combination with components that continually deliver unbelievable results. Avantes is a leading innovator in the development and application of miniatures spectrometers. Avantes continues to develop and introduce new instruments for fiber optic spectroscopy to meet our customer’s application needs. Avantes instruments and accessories are also deployed into a variety of OEM applications in a variety of industries in markets throughout the world. With more than 18 years of experience in fiber optic spectroscopy and thousands of instruments in the field, Avantes is eager to help our customers find their Solutions in Spectroscopy®.